Stalin's favorite; at one time it would have meant honor. In this day and age, the phrase might be met with a bit of revulsion. 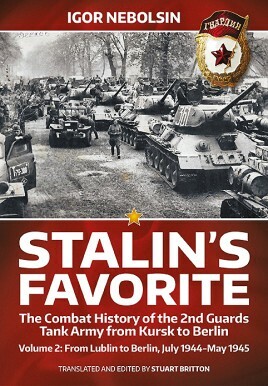 This is the second volume of a masterful work on the history of the 2nd Guards Tank Army. In this volume we see its history from the battles for Lublin,Warsaw, and finally the capture of Berlin. After the war, it was stationed in East Germany and was actually disbanded in 1997. In 2001 it was reactivated. More than 103,000 of it's troops were decorated with medals and 221 of them were named Heroes of the Soviet Union. After the tank armies success in the Berlin battles is when it became 'Stalin's favorite'. The 2nd Guards Tank Army would have been in the thick of the Battle for Germany had WWIII broken out. This is a monumental work that is filled to the brim with combat and after-combat photos, but also contains photos of all of the separate unit commanders that made up the 2nd Guards Tank Army. There are sixteen pages of colored maps of the tank army's various battlefields. The pictures also show you the different lend-lease tanks that were in action with the Soviets, especially Shermans. The author not only shows us its history, but also adds his own conclusions to the write ups of its different combat actions. 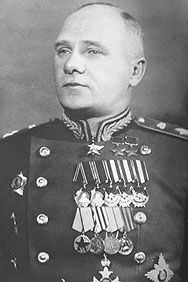 One of the highlights is the remarks of General Bogdanov's thoughts for the correct order of battle for a tank army, and an appreciation of the correct use of tank armies in combat. For each operation, the author not only gives us the order of battle for the 2nd Guards Tank Army down to the individual tanks, but also the order of battle for their enemies. There are also some remarks from German officers who had to face the 2nd Guards Tank Army. The book is separated into three parts. The first 412 pages are dedicated to its use and actions up until the end of WWII. Next there is next an 'afterword' section that details its history for the next fifty years, and even discusses veterans' reunions. After that comes almost fifty pages of appendices. For a complete history of a Soviet tank army in WWII, look no further. This is a wargamer and statistician's gold mine for information. You even get a Soviet appreciation of the vaunted German panzerfaust, and its effectiveness. Thank you once again Helion & Company, and Casemate Publishers for bringing us another history home run.